The stock market largely received good economic data and earnings this week which was a reminder that interest rates are likely to normalize (rise) in the coming 12-24 months. 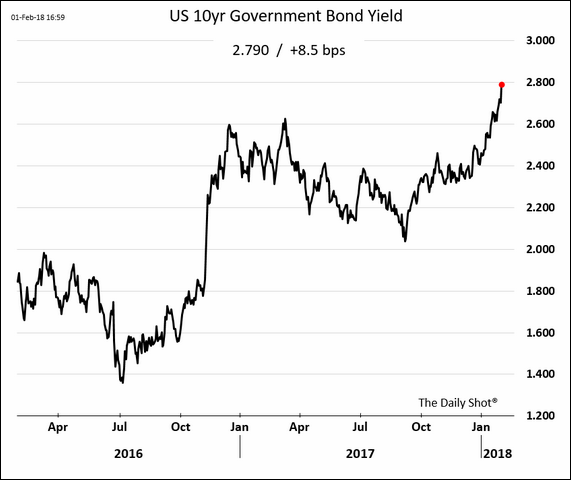 This wouldn’t be such a big deal if the Fed had begun rising interest rates a few years ago but now the market is beginning to wrestle with fears of “catching-up”. So now, the stock market is 4% below last week’s close in reaction to this fear. Why? Well, the long-term average interest rate on the 10 year treasury is around 5.5% – we closed at 2.85% on Friday. I doubt we get anywhere close to 5.5% in the next 24 months but the market just woke up to the fact that the free ride from the Fed is ending and we can no longer ride the tricycle of 2% growth coupled with quantitative easing. 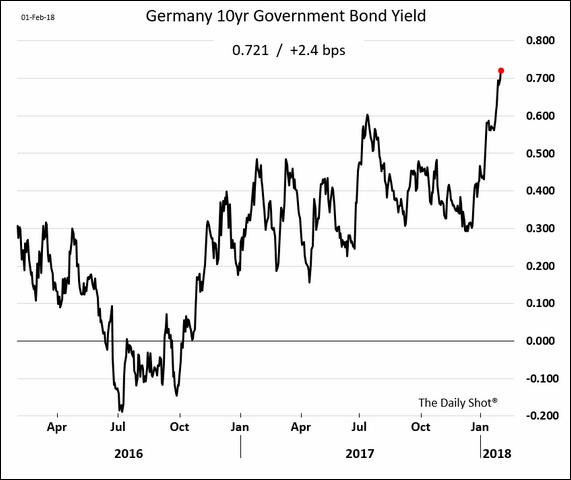 Germany: Ultra-low rate that has doubled to 0.72% in the last few weeks. United Kingdom: Fear of BREXIT? Now at 1.53%. Canada: NAFTA fears? 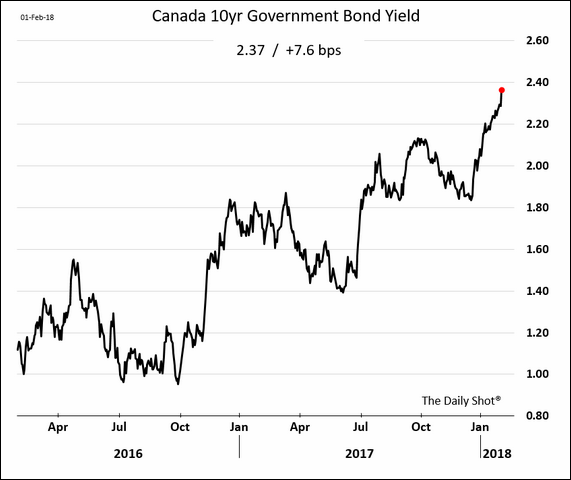 There is a potential for a real estate bubble here so watch how interest rates and real estate prices play against each other in Canada. 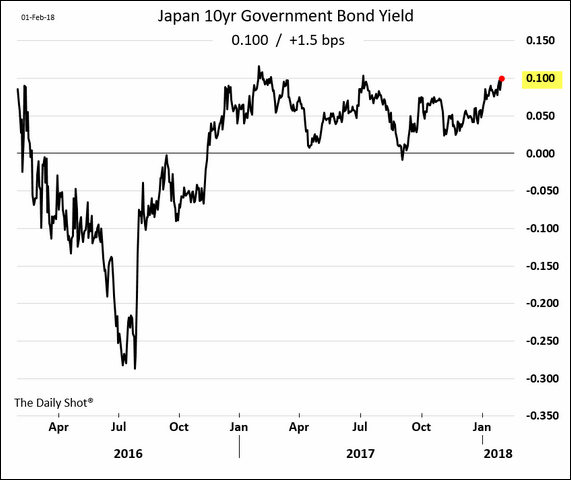 Japan: The Bank of Japan has now set up a ceiling for interest rates as they will buy any bonds that yield above 0.1% – effectively providing a floor for the price of their bonds. Keep in mind that Japan’s government spends something like 40% of their tax receipts on paying interest on their sovereign debt. 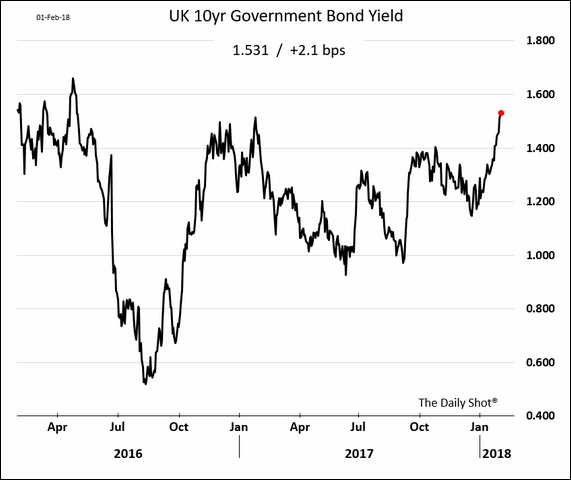 They will do anything possible to manipulate the rate they pay on their 10 YR bonds to keep their budget from imploding. History tells us that they will eventually lose control of their yield curve and the Yen will go down in flames. The canary in the global central bank manipulation coal mine is Japan – so pay attention if you see the Japanese 10YR spike above 0.10%. Yes, zero point zero one percent. At this point, I think Japan uses a cuckoo bird and not a canary. 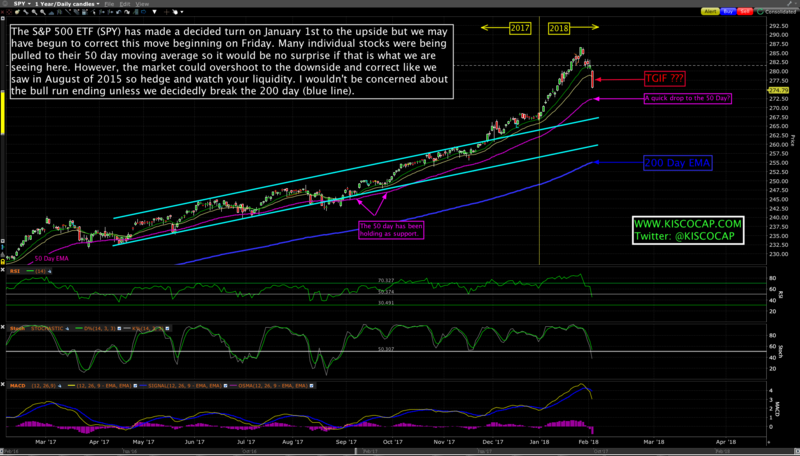 No emergency in the near term but keep this nugget of information in the back of your head. United States: We are leading the pack higher as the prospect for growth looks better given the potential for increased corporate investment due to the new tax bill. 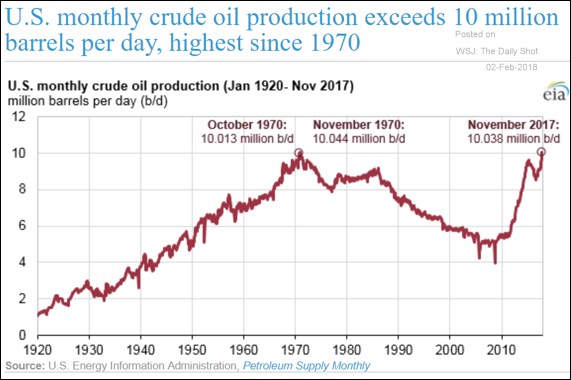 Hey, borrow in Yen at 0.10% and build in the USA??? In the chart below, notice how interest rates began to spike the closer we approached the vote for the tax bill. We almost got to 2% in the Fall and now we are eyeing 3%! Non-Farm payrolls were released on Friday where 200,000 jobs were added last month according to the Labor department. Wall Street economists had expected an increase of about 180,000, according to Bloomberg. The unemployment rate was at 4.1%, the same as in January and the lowest since 2000. Wage growth accelerated, with average hourly earnings for private-sector workers climbing 0.34% on the month and up 2.9% over the past year – which is good to see for the U.S. labor force. The closely watched index of consumer confidence, tracked by the Conference Board, rose to 125.4 in January from an upwardly revised 123.1 in December. 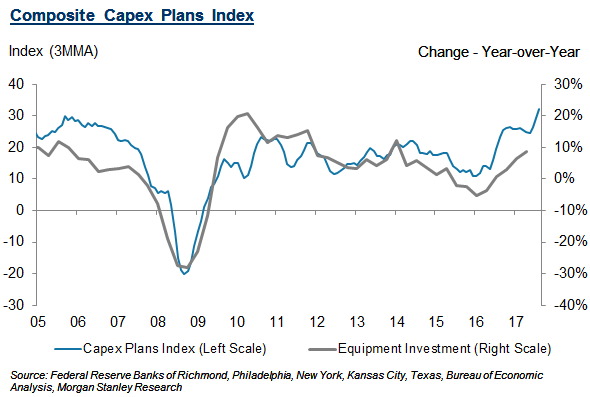 Morgan Stanley: The Capex Plans Index is a three-month moving average of a manufacturing-weighted composite compiled from monthly regional Federal Reserve Bank surveys measuring 6-month capex plans and tends to lead growth in equipment investment by about 3 months. The positive outlook suggested by our Capex Plans Index is consistent with recent economic data, although December durable goods orders were more mixed. The key forward-looking gauge for equipment investment—nondefense capital goods orders excluding aircraft—disappointed in the durable goods report with a 0.3% decline, although this was largely offset by a sizable upward revision to November (to +0.2% from -0.2%). Core capital goods orders are now up 12% annualized over the past three months, still a quite strong pace that should provide a solid ramp for continued momentum in business investment growth through the first quarter of 2018. Songwriters and music publishers will receive a 44% increase in royalty payments from music streaming companies over the next five years. The Copyright Royalty Board of the US Library of Congress issued its decision to alter formulas for how much streaming companies, like Spotify and Pandora, must pay songwriters and the music-publishing companies selected to collect fees on behalf of artists. Although the CRB has yet to make details of its ruling public, the National Music Publishers Association said streaming companies will be required to give 15.1% of their revenue to songwriters and music publishers — up from 10.5%. The SEC says it’s received court permission for a receiver to seize cryptocurrencies held by Dallas-based AriseBank. 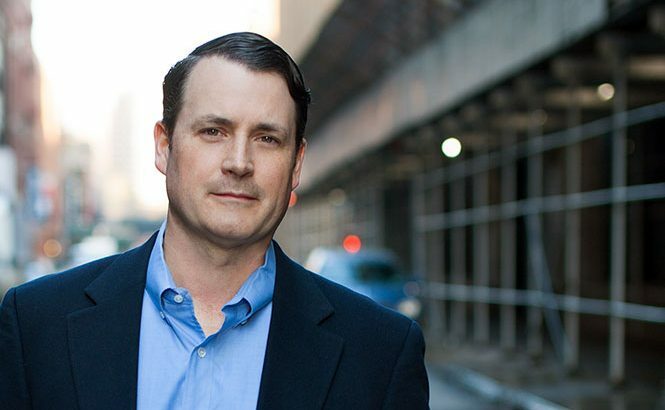 The company, according to the SEC, has fraudulently mislead investors about ownership of a federally insured bank and its ability to offer a Visa card backed by any one of several hundred cryptos. According to AriseBank, it’s raised $600M since launching its ICO in November. Tesla on Thursday sold $546M of bonds backed by lease payments on Model X and Model S vehicles, WSJ reports. Greece is to bring a seven-year bond to market in the next two weeks, in what would be its first debt-raising since its return to the capital markets last summer. Greece aims to raise up to €3bn in seven-year paper, to be followed by a three-year bond and a 10-year bond in the coming months, according to a source familiar with the situation. Saudi Arabia‘s state-owned oil giant and Google parent Alphabet, two of the world’s biggest companies, are in talks about jointly building a large technology hub inside the kingdom, people familiar with the potential deal said. An alliance would help bolster the development of the technology sector in Saudi Arabia, a goal Crown Prince Mohammed bin Salman has pointed to as a key part of his plan, known as Vision 2030, to wean the kingdom off its reliance on oil. Regards and thanks for reading all the way to the bottom!